A great way to catch all the important moments is to enable SpotCam mobile and E-mail active alerts functions. Below is a simple 1-2 step to make it work, and remember, this is FREE! 1. Enter video watch page and open your SpotCam settings on your computer. 2. Select EVENTS tab at the top of the settings screen, and then turn Alerts to ON, also select the activity for which you would like to receive alerts. 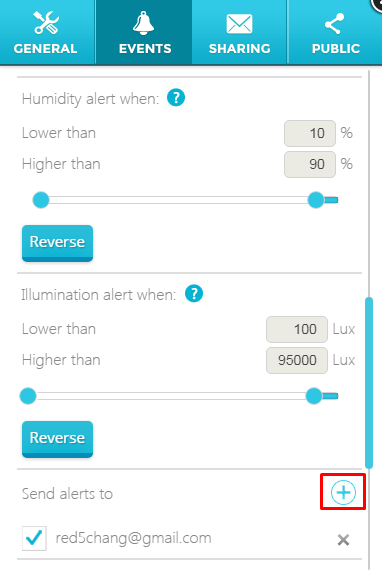 You can also adjust SpotCam detection sensitivity in the same page, higher sensitivity will lead to more activity detections for sound and motion. 3. 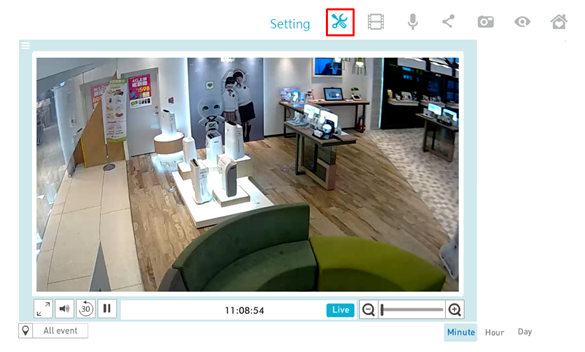 SpotCam will now detect the alerts you selected, and you can always change you mind by change the setting. Now that SpotCam is detecting activity you selected, choose how you would like to be notified by SpotCam. 1. 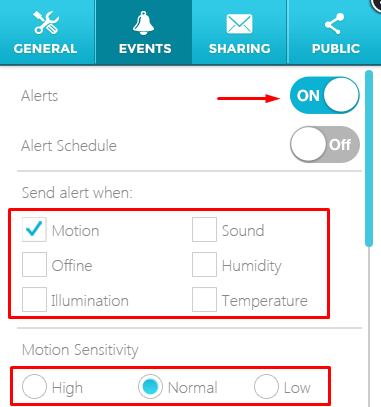 Go to EVENTS tab of SpotCam settings screen, the same page where you select your alerts activity. 2. Select the (+) icon next to "Send alerts to" to add the mail address to which you would like the alerts to be sent. 3. If you like to receive alerts on your mobile or tablet, please download SpotCam APP for your device and make your SpotCam appear in MySpotCam list. Alerts will then be sent to your mobile or tablet as push notifications.